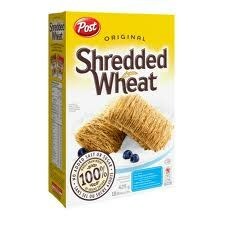 Shredded wheat is a breakfast cereal made from whole wheat. As of January 2010, it was available in three sizes — bite sized (¾×1 in), miniature (nearly half the size of the bite-sized pieces), and original. Both smaller sizes are available in a frosted variety, which has one side coated with sugar and usually gelatin. Some manufacturers have produced "filled" versions of the bite-size cereal containing a raisin at the centre, or apricot, blueberry, raspberry or cranberry filling.